AT&T PARK — The Dodgers tried — and failed — to buy the glee the San Francisco Giants earned Friday night by clinching their second NL West crown in three years. 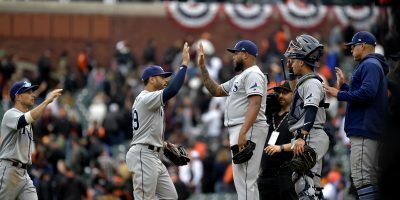 Playing teams that were out of contention months ago, the Giants took advantage of them by first sweeping the last-place Colorado Rockies then winning the first two games of their series against the lowly San Diego Padres. The Giants scored two runs in the first, fourth, and sixth innings to beat the Padres 8-4, and are the 2012 National League West Champions. For the second time in three years, the Giants are headed to the postseason. Marco Scutaro had three hits and three RBIs. Hunter Pence was 2-for-2 with a sac-fly. Madison Bumgarner had his game face on and pitched like it. MadBum (16-10) went 5 2/3 innings, allowed five hits, three runs, two earned, walked one and struck out six. The poor Padres struggled through a tough season only to — once again — watch the Giants clinch a playoff berth against them. 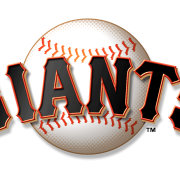 The Giants have won eight National League West titles since divisional play began in 1969, sealing six of them against San Diego. The Padres scored a run in the first. Chris Denorfia led off with a single to left. He stole second, advancing to third on an errant pickoff throw to second base by Brandon Belt. The Giants responded in the bottom of the first scoring two runs. Angel Pagan walked. Marco Scutaro singled to left and also extended his hitting streak to 12 games. After a walk to Pablo Sandoval loaded the bases, Buster Posey and Hunter Pence each drove in runs with sacrifice flies. Bumgarner aided his own cause with an RBI single in the bottom of the second. The Giants plated two more in the fourth inning on a Scutaro two-run single. In the 8th, Brandon Belt provided the icing on the cake with an opposite field home run that was hit nearly 400 feet. Maybe the funniest moment was in the top of the 9th. In recent weeks, the Korean pop hit, Gangnam Style by Psy has become a fan favorite. Only this time, cameras caught Giants radio announcer Dave Flemming trying to do some shadow horseback riding and that drew a huge applause and laughter.